If you are a student of the “liturgical year” you will notice that it is anything but fixed. Sure some days, like Christmas, are fixed, but there are a tremendous number of days that are not. For example, in the Lutheran Service Book we set aside February 10 as the Commemoration of Silas, Fellow Worker of St. Peter and St. Paul. However, in Lutheran Worship Silas’ day was on January 26. Furthermore, in Lutheran Worship, Silas’ day was a “minor festival.” Back when we used The Lutheran Hymnal, Silas had no day at all. 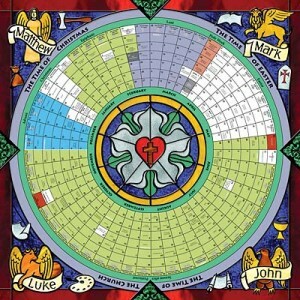 Just how sparse or full a liturgical calendar is depends entirely on who is putting it together. Also the names accorded each day are dependent on the compiler. The one we use in the LC-MS was put together by The Commission on Worship of The Lutheran Church – Missouri Synod. They didn’t, however, put this calendar together in a vacuum. They consulted as many current and earlier liturgical calendars they could, seeking to represent the “catholic” nature of the Church (“catholic” meaning universal). Our calendar has basically four categories: Principle Feasts, Feasts, Festivals and Commemorations. Other calendars have more or fewer categories. All Feasts and Festivals have their own specific “propers.” “Propers” are those elements in a typical worship service that change, like the assigned scripture lessons, the prayer of the day, etc. On our calendar we have only three Principle Feasts: Christmas, Easter and Pentecost. These are intended to always be observed and it is anticipated that the Lord’s Supper will be offered on these days. Aside from the Principle Feasts, on our calendar, all other Feasts and Festivals may be observed if they fall on a Sunday. This is left up to local custom. Some churches observe them all, not only by using the propers of the day for the observance, but also by offering the Lord’s Supper. An addition to our liturgi cal calendar made in the Lutheran Service Book is the “commemorations.” As I said above, these dates do not have distinctive propers associated with them on our calendar. If they happen to fall on a Sunday the pastor may remember the saint or event in the church’s general prayer, but most likely that will be it. The exception might be if the local church has actually adopted the name of the saint or event as the name of the congregation. Then they might make more of the day. Most of these dates remember Old Testament saints as well as individuals or events that span the first 19 centuries of the Church’s existence. A few New Testament saints can also be found here, but most of the New Testament saints are given the status of “Festival.” These individuals and events are not placed here for their own sake or glory, but to point us to the Christ to whom they themselves pointed. They also serve the general purpose of reminding us that the Church of Christ did not spring to life in our lifetime, but spans the entire history of humanity. Finally, remembering them can inspire us to learn more about our history as the people of God. The final “day” element on our calendar is “occasions.” All our calendars in our various hymnals over the years have some such category. They give propers for things like a service of thanksgiving, the anniversary of a congregation, mission festival, and so forth. It is common, in our denomination, for individual churches to add to these “occasions” other “occasions,” like “Sanctity of Human Life Sunday” or “LWML Sunday” or “Lutheran Hour Sunday,” or “Concordia Sunday.” As is the case with all “occasions,” this is completely left up to local preference. Any student of the liturgical calendar knows that the year is also divided into “seasons.” This carries with it its own reasoning. 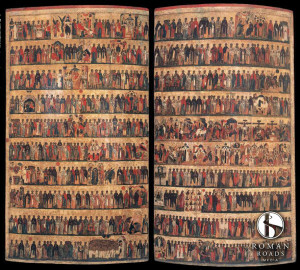 Calendars also have various colors that are used on the altar for different saints and seasons which, again, have meaning. God willing, I will explore such things in future posts.